Message posted in JUNE 2017. Things haven't changed in 3 years. So thanks for the tip, I could find my parcel handled locally by UPS - I needed to contact them because they have the bad habbit of noticing the client just a few minutes before the delivery and I cannot stay put in one point forever, so I need to know beforehand wehn the delivery is done. I currently have 2 orders through ebay, i hope I don't face any issues or delays, but following up on tracking is a pain in the a$$. Once the parcel reaches a certain mid point it seems to be stuck there. The estimate delivery at the time of purchase was 15 July so I hope I would still get the goods on time. Again, I haven't faced any issues and have no complaints "as yet", but coming across this interesting thread yesterday, made me research more as it actually got me more concerned. So I thought I would share some of my findings. While the parcel is still in states, and before customs and clearance, I believe Pitney Bowes is the conglomerate in charge, and their tracking no starting with UPAAB... can be best tracked using their site " https://parceltracking.pb.com ". U can actually see the order number as well as a route map to track your order. UPAAA number belongs to Pitney Bowes which you can check tracking info on Pitney Bowes tracking site. Cheers! It is Jan 2018 and this no longer works. The tracking code no longer has blue link with it and there is no way of finding where the package is. ...then I do indeed see a bold blue tracking-link for an item which I recently bought (although in Germany), and this item which was shipped via the eBay system (Pitney Bowes, I believe). In my case a link is shown in bold blue to the right of the "Tracking Number" with a Track-and-Track number which opens a tracking-window (NB: Via a Java-script, so you need Java installed! ), when you click on this (bold-blue long number). That's at least the way it looks and works for me, here in Copenhagen, Denmark, today, in late January, 2018! If you are unhappy about how things work in the Netherlands (eBay and/or whatever other stuff! ), then you're certainly very, very welcome to come and live here in Denmark... it's an absolutely wonderful country! I won a bid on T470 on August 6th 2018, paid for it couple of hours later. Shipping was indicated as Expedited Delivery (International Priority Shipping), so no mention of GSP. And it was also quite hefty, 44GBP for shipping from UK to Croatia. First indication that its not regular shipping was in Paypal invoice that listed only 10GBP to the seller and rest was automatically sent to Pitney Bowes in another transaction. I was still thinking that seller would simply ship it to me directly,after contacting him he told me that it most likely would be shipped via Royal Mail. Only after I received 3 tracking numbers I realized that it was the atrocious GSP, he did use Parcelforce but only to ship it to GSP. 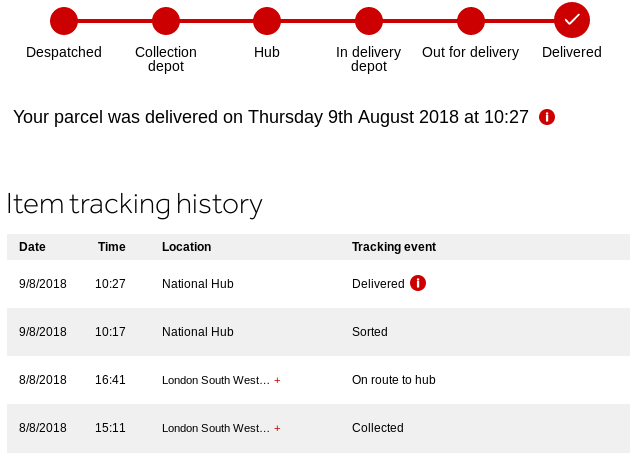 Parcelforce tracking worked fine and shows that it was delivered on August 9th 2018 at 10:27 in the National Hub of Parcelforce. But both of UPAA tracking codes are absolutely useless. Anything I can do other than wait?